For his latest release, Burt Bacharach has teamed up with Irish vocalist Ronan Keating for a newly recorded collection of his classic compositions. Burt and Ronan recorded the album live in the legendary Capitol Records studio with a 95-piece orchestra. The CD was released in the U.K. on March 21 and will be released in the U.S. on March 29. 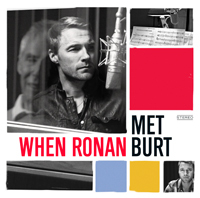 For more information about When Ronan Met Burt , visit RonanKeating.com.